Customer engagement is all about personalization and in this age of mass customization, generic, standardized messages are not going to cut it. Brands are leaning on Braze, the NYC startup that has perfected customer engagement through its platform, to send relevant, personalized, and human-likes messages to customers. On the platform, brands can create and maintain customer profiles in real-time, armed with current and predictive data that’s used to ensure you are engaging customers in a way that will yield the highest ROI. The company’s platform powers billion of messages per month for some of the top global brands including Citi, Gap, Hearst, and KFC across push, email, in-app, and more. 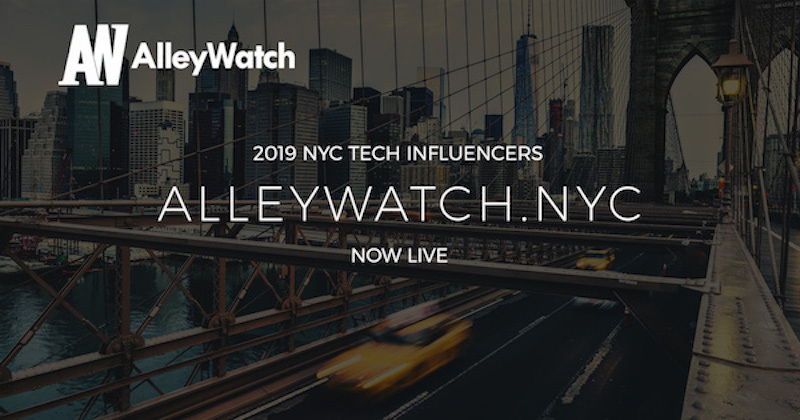 AlleyWatch spoke with CEO and Founder Bill Magnuson about the company’s impressive trajectory, rebrand (the company was previously Appboy), and most recent funding round, which brings its total funding to $175.1M across ten rounds since its founding in 2011. 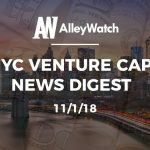 Braze announced an $80M Series E round of financing led by Meritech Capital Partners, a venture capital firm with investments in leading technology brands such as Facebook, MuleSoft, and Salesforce. In addition to participation from existing investors, we also welcomed Spark Capital and Cross Creek to our investor syndicate. Tell us about the product or service that Braze offers. 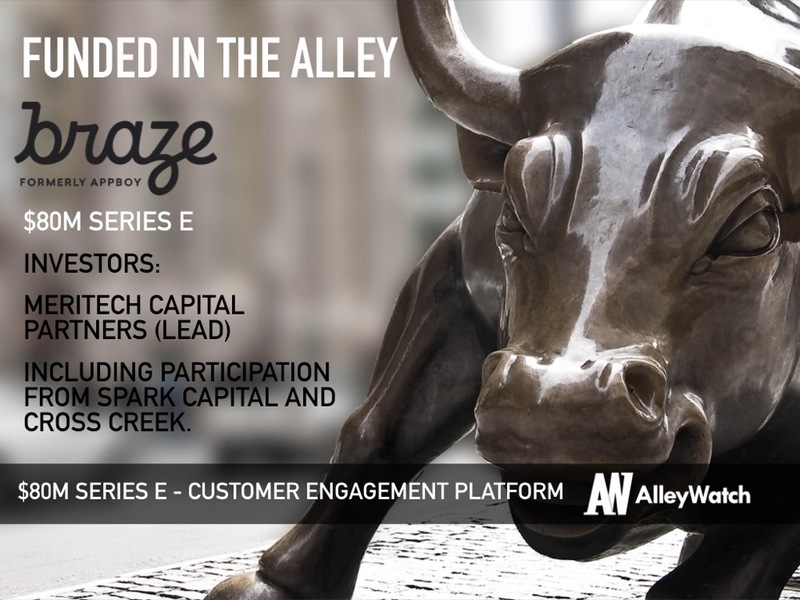 Braze is a customer engagement platform that helps brands like Disney’s ABC News, Delivery Hero, Lyft, and Microsoft deepen connections with their customers through technology that drives directly attributable ROI for businesses. We are positioned as the backbone of effective customer engagement, making messages from brands to their customers feel more like human conversations. First, the platform transforms historical, in-the-moment, and predictive data into a live customer profile, which makes a better starting point for relevant messaging experiences. Next, we’ve got a visualization and orchestration tool that makes it easier for marketers to craft and optimize campaigns that delight users and deliver ROI. 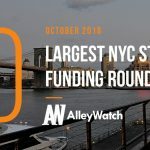 Third, we built Braze as a stream processor to ease integration with built, bought, and combined systems so it’s simpler for any business to create the tech ecosystem that’s right for them right now—and we just announced Braze Alloys, our partnership platform of 45 solutions providers ready to go. That really helps us maximize our customers’ time to value, which is a key distinguishing feature from legacy competitors in particular. How has the business changed since we last spoke after Braze’s Series D round last year? Since we raised our Series D in August 2017, we changed our name from Appboy to Braze and oversaw a global rebranding effort; we were named a Leader in the Forrester Wave™: Mobile Engagement Automation, Q3 2017 evaluation; hosted our fourth annual Long-Term Relationship (LTR) Conference in NYC; and officially expanded our support and growth into the APAC market with the opening of an office in Singapore in May 2018. In addition, we received recognition by Forbes Cloud 100 at #85, ranked #225 on Inc.’s 500 Fastest Growing Private Companies, and recognized at #17 on Crain’s Fast 50 New York List. We’re incredibly proud of our rapid, responsible growth and we’re looking forward to what next year brings! What market does Braze target and how big is it? 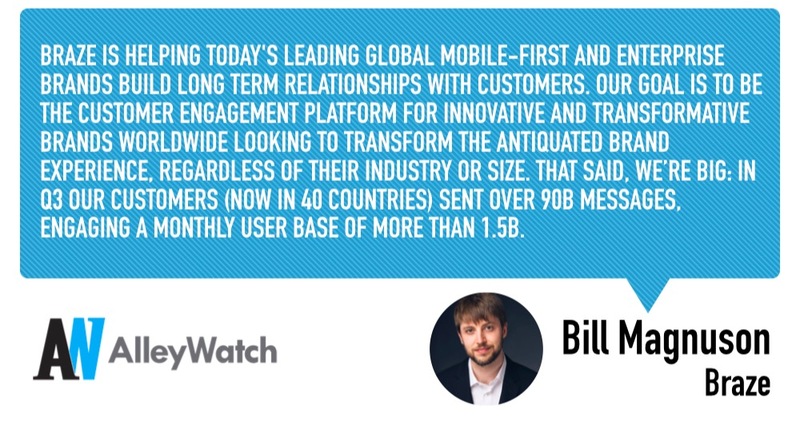 Braze is helping today’s leading global mobile-first and enterprise brands build long-term relationships with customers. Our goal is to be the customer engagement platform for innovative and transformative brands worldwide looking to transform the antiquated brand experience, regardless of their industry or size. That said, we’re big: In Q3 our customers (now in 40 countries) sent over 90B messages, engaging a monthly user base of more than 1.5B. We’ve built our product and company with patience, integrity, and depth. That focus and deliberation has made it possible for us to begin separating from the rest of the pack in our competitive space by providing technology that more effectively bridges the gap between brand marketing needs and modern customer expectations. In addition to our product strength and strong business fundamentals, our investors prioritized direct feedback from our customers as an important measure of success. The passionate advocacy of Braze customers and the value they see in our cloud-based customer engagement platform is a central part of our growth, and our investors recognize this—as well as our company’s potential to surpass a generation of marketing tools that are no longer working. In the near term, we’re leveraging this investment to enhance our customer support and services, pouring more money into R&D, going multi-cloud, and continuing our global expansion. We also recently announced upcoming work on deep learning models to add behavior predictions, additional support with Roku, and a pilot with WhatsApp Business through Twilio. My favorite restaurant in NYC is Uncle Boons in Nolita — highly recommend!